” It is important for children to form good habits by choosing healthy drinks from a young age. It’s not only important for children but adults as well, and children are more likely to learn healthy habits if they see the adults around them making healthy choices. “Water is the best choice, It doesn’t have any sugar in it and it’s free, straight from the tap.Plain milk is also a very good choice with important benefits such as building strong bones and teeth. ” The Sugary drinks proper no good – Drink more water Youfla campaign includes access to free water throughout the local community. An apple a day might help keep the doctor away and could also mean better performance at school. One thing that we tend to think less about is the type of drinks that we are having. 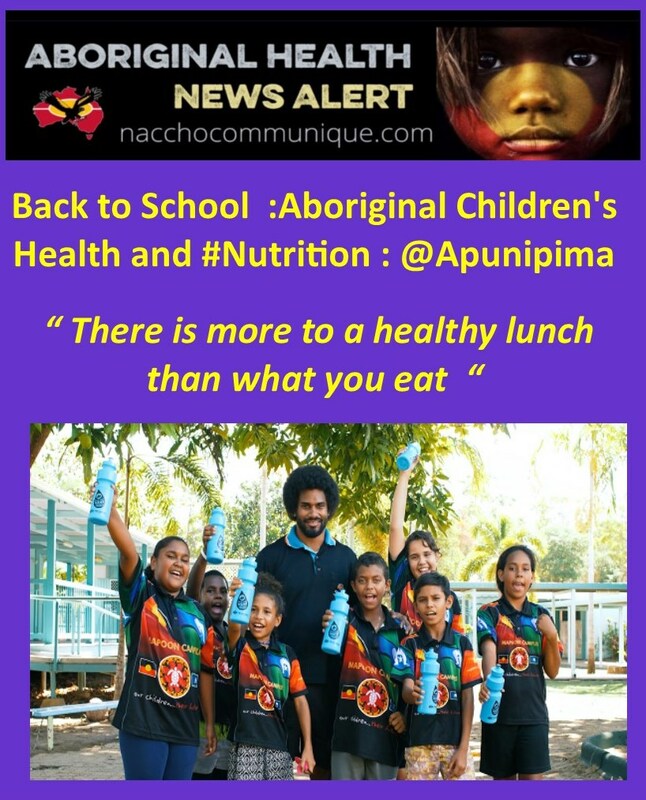 As school has started for most Queensland children last week and many interstate today , Apunipima Cape York Health Council wants to remind families that healthy drinks are just as important as healthy food for good health. Sugary drinks have become popular choices but they have little or no benefit to health. Sugary drinks refers to all drinks with added sugar such as soft drinks, fruit drinks, cordials, sports drinks, and flavoured waters. An alternative to having a ‘popper’ fruit drink or juice is to have a piece of fruit and water as a drink instead – these are much better choices! Kani said packing healthy drinks with lunches was easy – keep it simple. Too many sugary drinks can harm our health, by causing weight gain and obesity as well as poor dental health in both children and adults. Drink water before you feel thirsty. Apunipima is currently leading the ‘Sugary Drinks Proper No Good – Drink More Water Youfla’ social marketing campaign to promote key healthy messages around drinking water. A series of videos have been developed with three Cape York communities to promote water as the drink of choice. The social marketing campaign is part of a larger project that involves a range of activities in the communities, that include adults and school aged children. Apunipima is a partner with the Rethink Sugary Drink Alliance to increase awareness, and to tackle high consumption of sugary drinks which has led to overweight and obesity, an increased risk of chronic diseases and, poor dental health. Excessive sugar consumption is a major health problem in many remote Aboriginal and Torres Strait Islander communities throughout Australia. The Sugary drinks proper no good – Drink more water Youfla campaign includes access to free water throughout the local community. ‘We’re really worried about the impact of sugar in our area, because of the high rates of overweight and obesity leading to chronic diseases such as diabetes and heart disease,’ Dr Mark Wenitong, senior medical officer at Apunipima Cape York Health Council in Far North Queensland, told newsGP. Aboriginal and Torres Strait Islander peoples today consume 15 g more free sugars on average than non-Indigenous Australians, with the majority of the excess coming in the form of sweetened beverages. In response to this situation, the Apunipima Cape York Health Council launched its public health campaign, Sugary drinks proper no good – Drink more water Youfla, in November. The campaign uses a variety of channels to raise awareness, with language designed to resonate with the target demographic. ‘The language came from our Aboriginal health workers,’ Dr Wenitong said. ‘We are trying to get the message into the communities in a number of ways, from primary healthcare clinics, through GPs and health workers; through radio and TV ads; and also through social media. In remote populations such as Cape York, some of the increased consumption of sweetened beverages can be attributed to the challenges presented by the logistics of a remote location. ‘Our area is tropical and remote, so there’s not a lot of infrastructure around with constant access to cool water, and we have lot of hot weather so people are always looking for a cold drink, particularly in summer,’ Dr Wenitong said. Dr Wenitong also believes there is a historical basis for sugar consumption among Aboriginal and Torres Strait Islander peoples. The Sugary drinks proper no good – Drink more water Youfla campaign also has a practical component in order to ensure its message is actually achievable. ‘[That involves] making sure there’s water coolers outside the store, free water in the schools, handing out free bottles that people can refill with water and keep with them,’ Dr Wenitong said. While the message of the campaign is simple and straightforward – just drink water – Dr Wenitong believes GPs can also use it to highlight a range of other positive health messages. ‘When you’re using self-management techniques, you’re really asking patients what’s most important in their lives and then hanging on that some of the things you know are healthy for them,’ Dr Wenitong said. Dr Wenitong hopes the campaign will have a positive effect on the health of his community and his people.